One of the benefits of a mindfulness practice is the experience of living in the present moment. 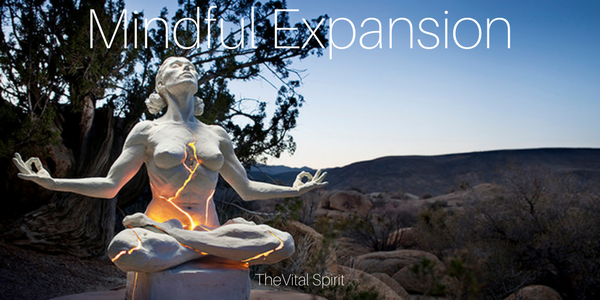 Mindful expansion means letting new data and ideas to penetrate in your awareness. It doesn’t require we latch on to any and all new information that comes our way. Simply that we pass new information through our filters and decide if it aligns with us and our higher self, or not. And when new information freaks us out a little, remember to remain open, even if we really want to dig in our heels. We are simply expanding out of our former understanding of ourselves. Have faith, we see this in science all the time. Our understanding of the solar system and physics has evolved dramatically since scientists first began studying our world. And don’t worry, the principle of incremental growth is true of less momentous belief systems such as what is healthy for us to eat and why we keep running into the same problem at work. At times, we may want to close ourselves off to growth because we are overly attached to our identity and the way we have always been. Be patient and stay open. Don’t shut down, simply give yourself time to align with the new information. A truth that is for us will keep making itself known. The laws of nature tell us that everything is either growing or it is dying. Therefore, when we remain open to new things and we take action to learn, seek, or implement new ideas then we are growing indeed.